The amritsari nan that you’re talking bout have made their way to various leading dailies such as TOI, Indian express, HT city etc. They are stuffed nan rather than amritsare kulche. I think he sells it for 70 bucks a plate now. I’d love to eat these Kulchas, one day!!!!!!!!! This is newly innovate dish @ my great grandfather time. You will find Kulche in amritsar on every street. And you will find differ taste. Hi all amritsari kulch fans. I live a few distance away from the shop in prashant vihar and whenever i feel like i scoot there for having a plate of amritsari kulchas; although it is not very often. I do so; not because i like the tastes of kulchas and chole there; but because i do not know as to what to do with the lingering taste of those kulchas and chole which continues to stay in my heart from my twice a year 5-15 day trips to the purana amritsar; where i happen to eat them almost every second day. I remenber the first time i had them there. For the info of all here; let me tell you that they serve only i piece of kulcha first and the second is not really required to keep going during the day; and it is totally different from the kulcha we are talking about here. 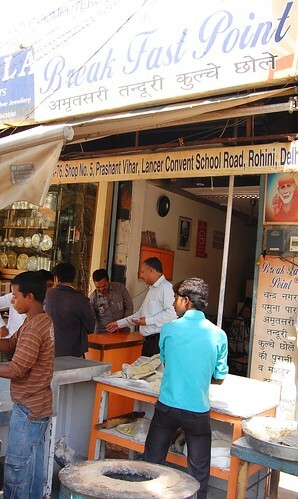 I went to the place today, but found a “Kanha” sweet shop serving Amritsari Kulche at Rs 50 for two. This is bang opposite the Lancer Convent. Same stuff, Kulche, chhole, raita and onion chutney, out of a thermocol plate, not like the photograph! Has the name changed meanwhile from “Breakfast Point” to “Kanha”. As you stay close by, can you tell us. Because you stay so close to this. Hey there, this comment is wrt to preceding post… No. 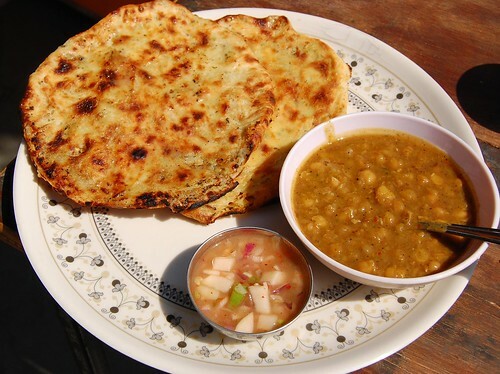 Kanha and breakfast point are two different shops, greatly varying in the quality of Amritsari Kulchas served there. Kanha used to be good at a point of time but has totally deteriorated over the years. The shop breakfast point is close to Kanha, but very different. BF Point has opened up recently in Model Town (Part 3) at the end of main market on your right side. The stuff is near same to what we get in Amritsar. A plate of 2 Amritsari Naans is for Rs.50 and you cannot have a plate alone, I bet. Check-out. Thanks for your mail. I visited BF point. But they open at 10 on weekdays and 0930 on Sundays. I live in Canada in an area called Surrey that is full of Sikhs. I recently came across this dish as a local cafe and went online to find out what was in it, as it’s so delicious and addictive. Thanks for the insight into this dish! And here in Canada it looks to be the same, however I could not eat more than one they are too filling. Hi, I went one Sunday at 0230 pm and the Chhole were over, had to do with only Kulche. Go early!